Special Guest(s): My buddy Matt and his girlfriend Marissa. 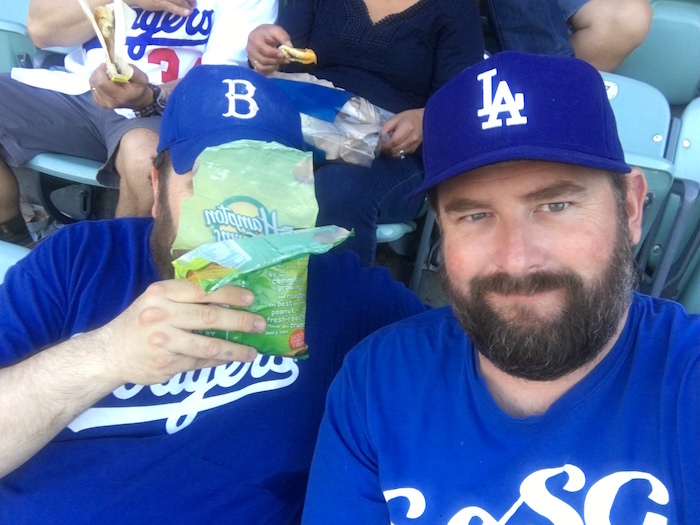 Snacks: A pair of Bud Heavies and Dodger Dogs. 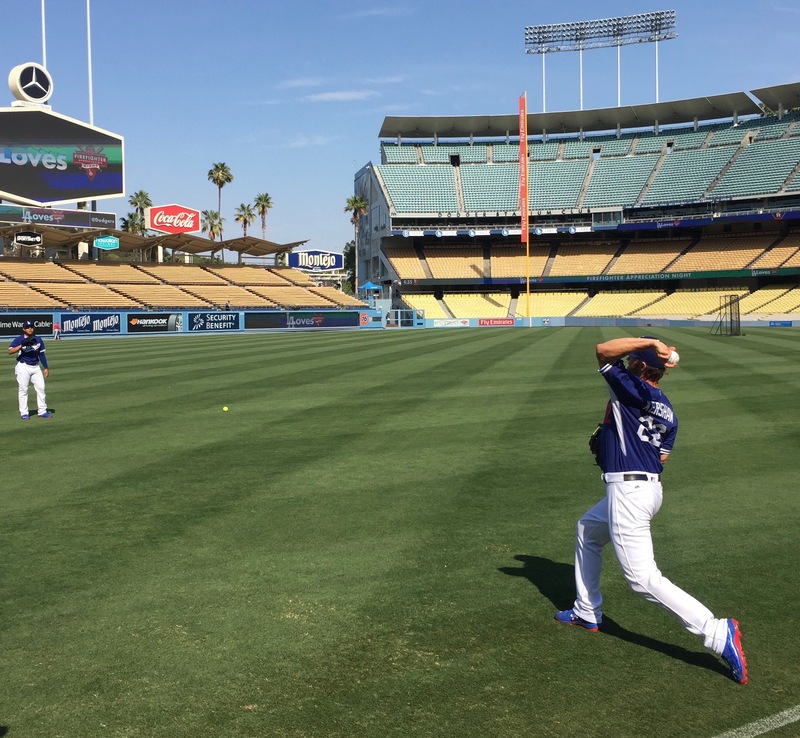 Memorable Moment: Watching Clayton Kershaw play catch with Julio Urias. Wut? RECAP: With this being my final game before taking an extended all-star break, I wanted to soak in the entire game day experience, starting with early BP. I even brought a glove in hopes of maybe snagging a couple balls to contribute to the baseball game our family plays on the 4th of July. But it was not to be. Oh well. 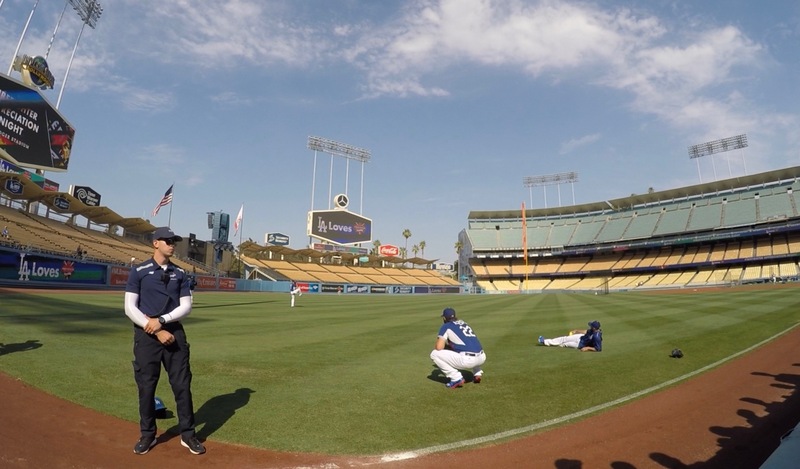 With everyone and their dog still recovering from the heatwave, the Dodgers skipped most of their portion of batting practice. 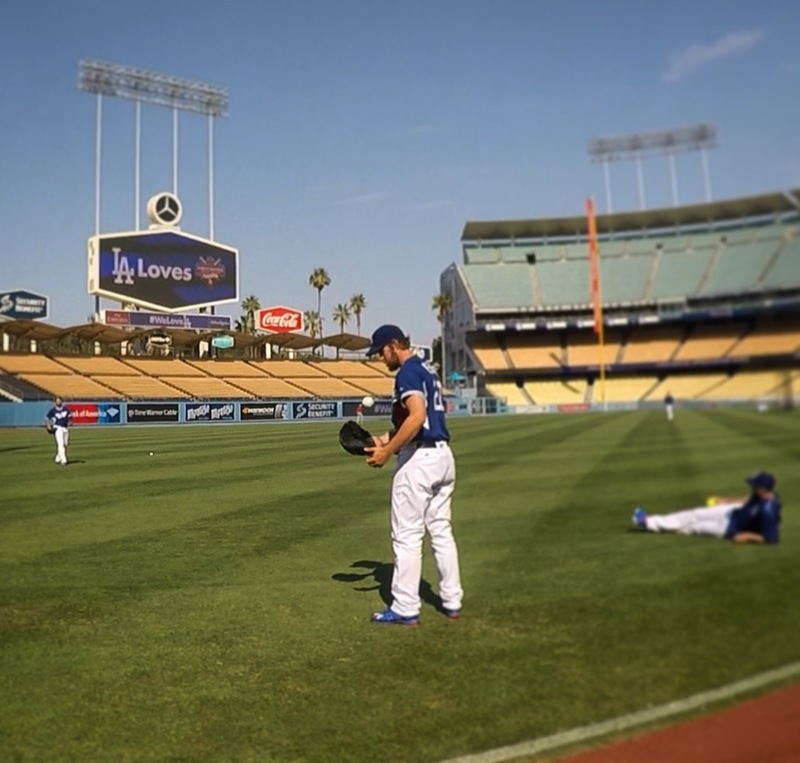 When the gates opened, the only player on the field was Kenta Maeda who was finishing up a running workout. 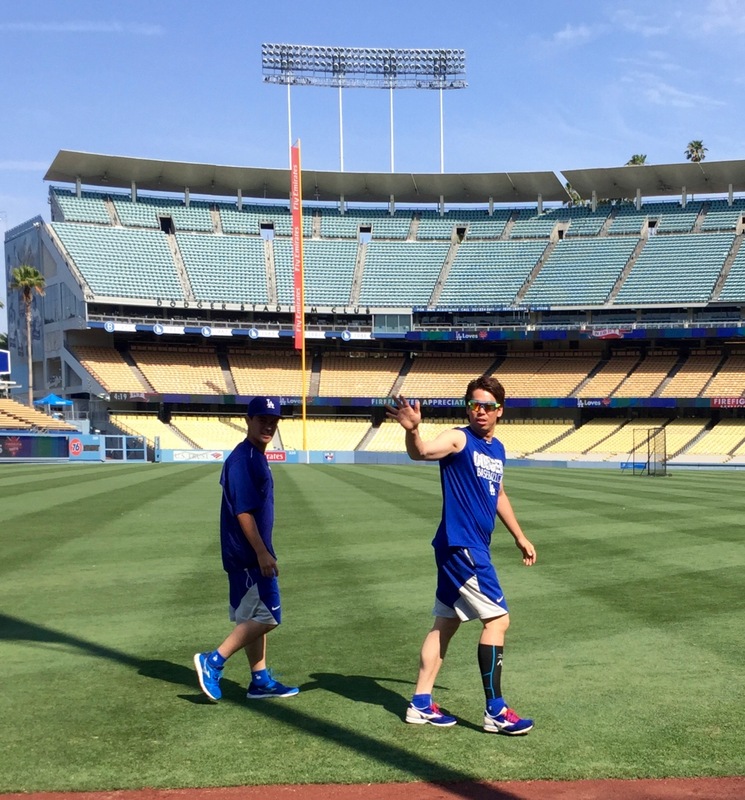 Kenta Maeda waves to fans after finishing his workout. 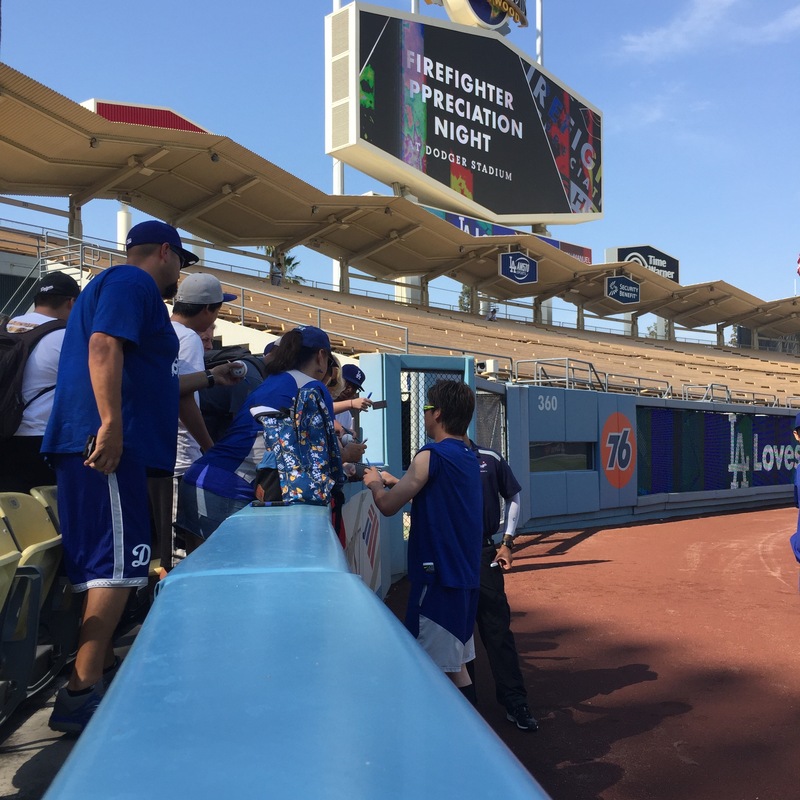 Kenta started heading towards the Dodger dugout but something caught his eye and he pulled a u-turn and jogged over to the fans gathered near the foul pole. This is the crowd that was gathered when Kenta started signing autographs. This was the crowd five seconds later. Out of the scrum emerged a very happy kid with a signed Kenta jersey from his days with the Hiroshima Carp. Safe to say he was probably the reason why Kenta changed his mind on signing. 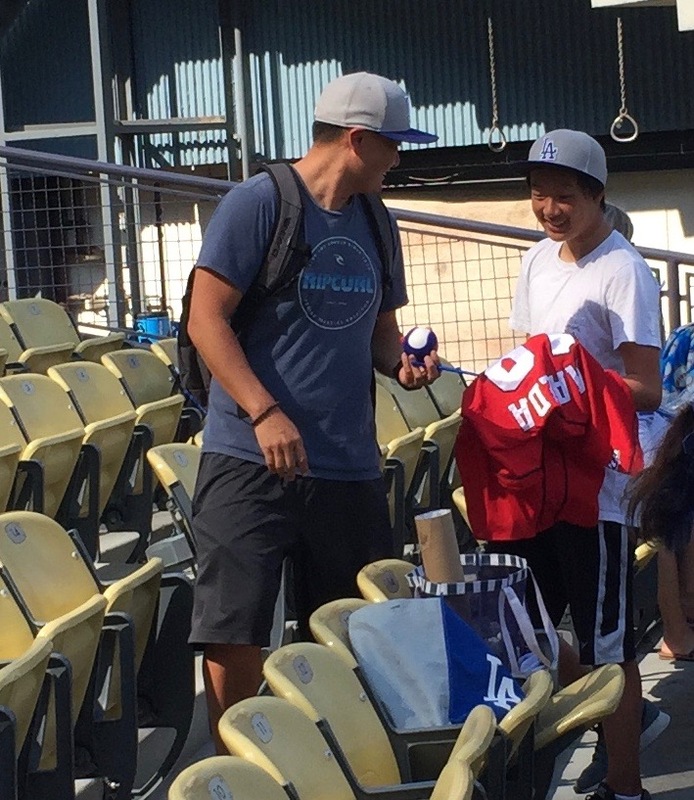 Everyone who snagged an autograph from Kenta should have bought this kid an ice cream helmet. 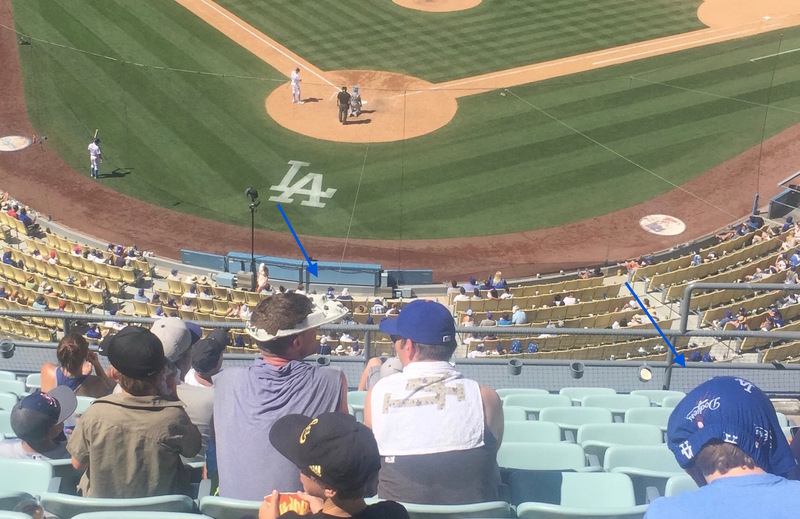 Not long after Kenta left the field, my friends Marc and Leslie arrived and so did a couple pitchers by the names of Clayton Kershaw and Julio Urias. Were they really about to play catch? 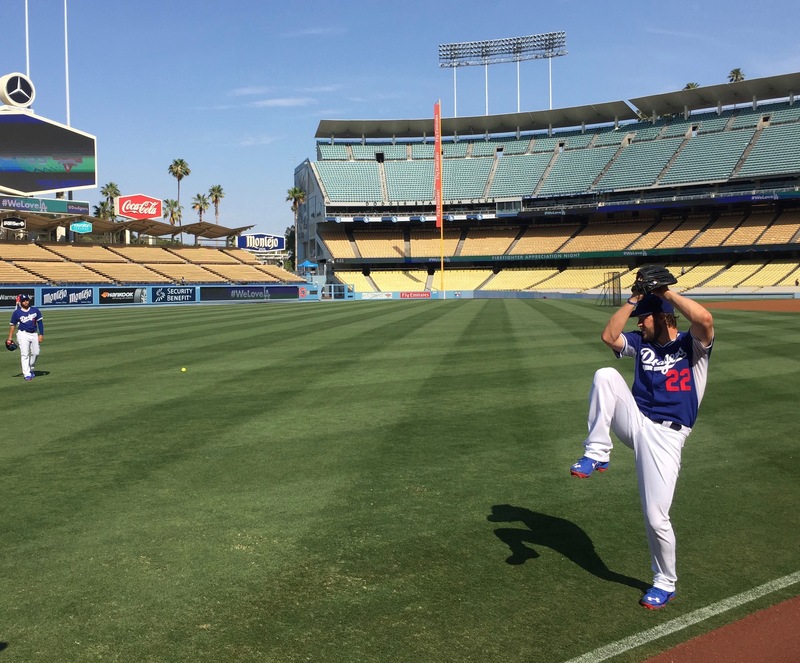 Julio Urias waits for old man Kershaw to finish stretching. We soon had our answer. It’s all in the leg kick, kid. 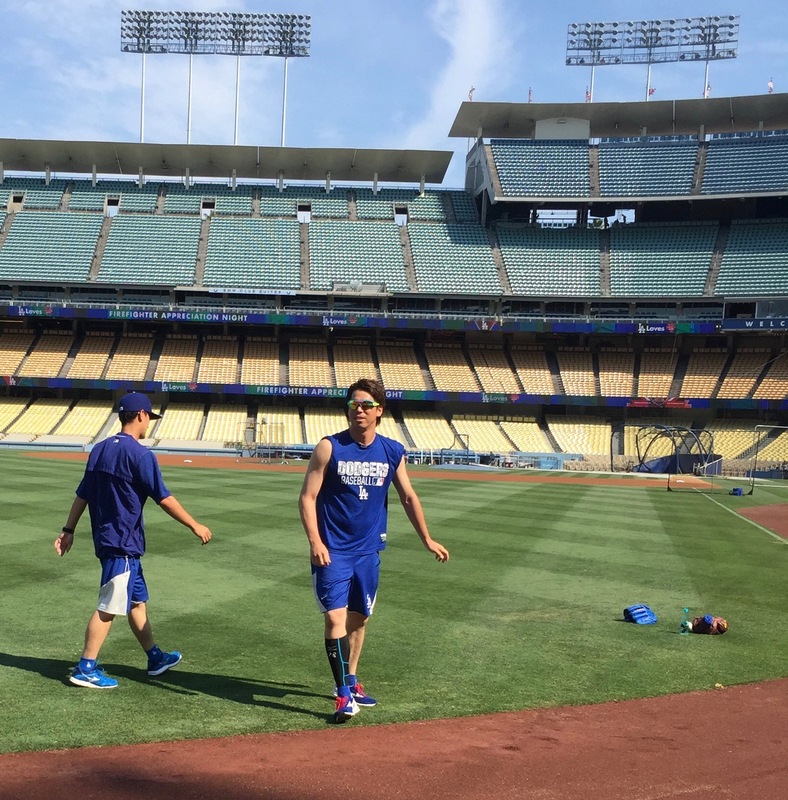 The Kershaw equivalent to Ice Man flexing during Top Gun’s beach volleyball scene. 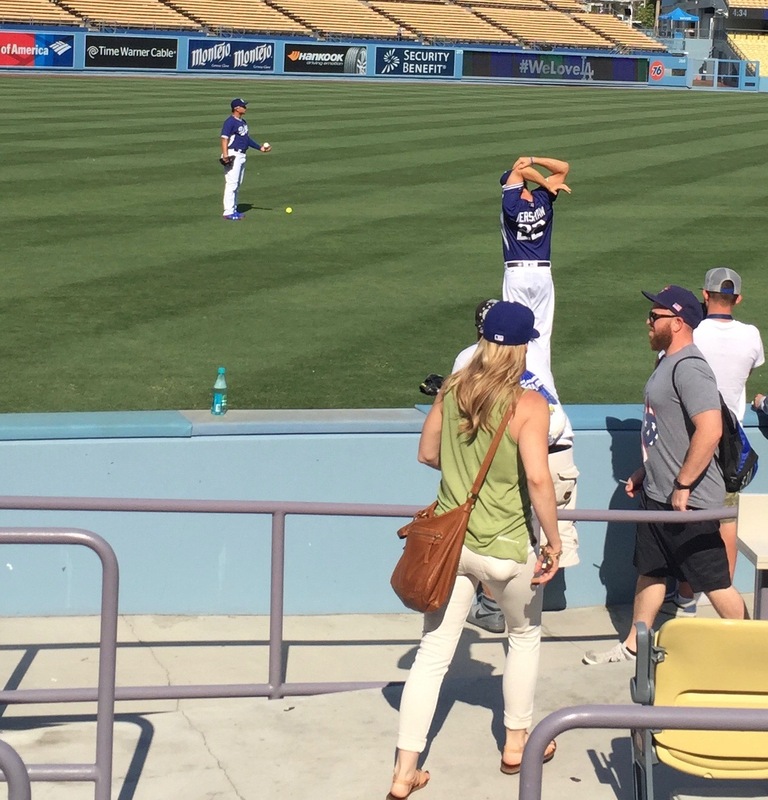 After a few warmup tosses, Kershaw did his best A.J. Ellis impression and caught for Urias as he fired off some jaw dropping pitches. The oohs and ahhs from us two dozen or so fans who were lucky enough to see this rivaled any fireworks show. It was amazing. 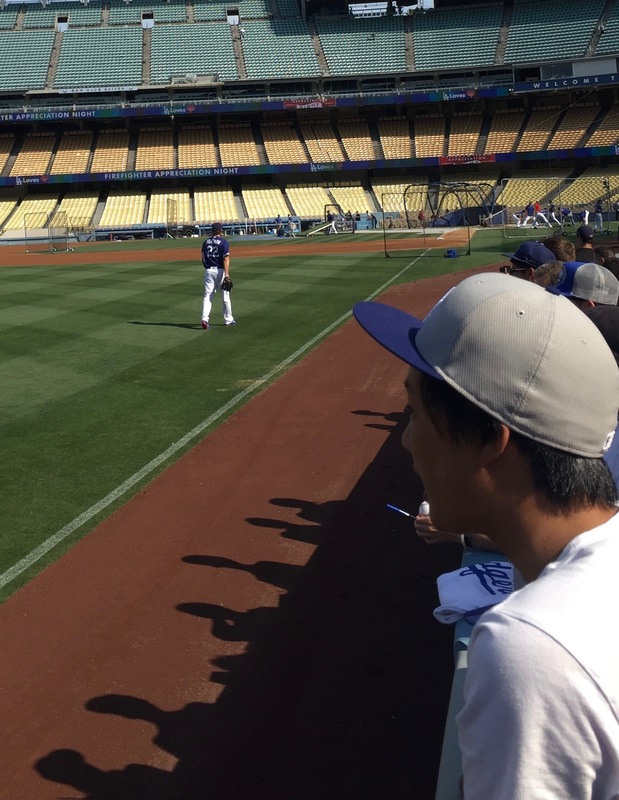 When they finished, Kershaw strolled off the field and left his young Padawan to hold court with his new fans. Kershaw’s work here is done. 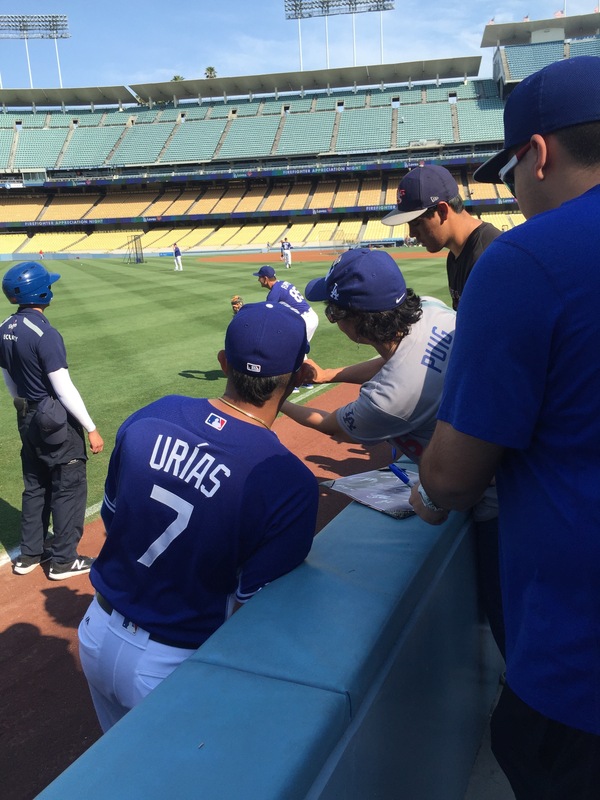 Trying to photobomb selfies with Julio Urias. As for the game itself, because it was Firefighter Appreciation Night, I gave our tickets to Matt and Marissa and purchased an extra ticket for myself so I could snag a Dodger firefighter t-shirt for my cousin Teagan who recently dominated as a junior competitor in the Wisconsin State Firefighter Skills Challenge. 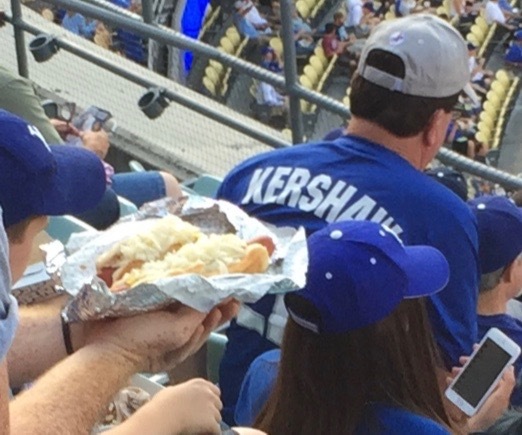 This guy gets a shout-out piling an entire bin’s worth of onions on his Dodger Dogs. 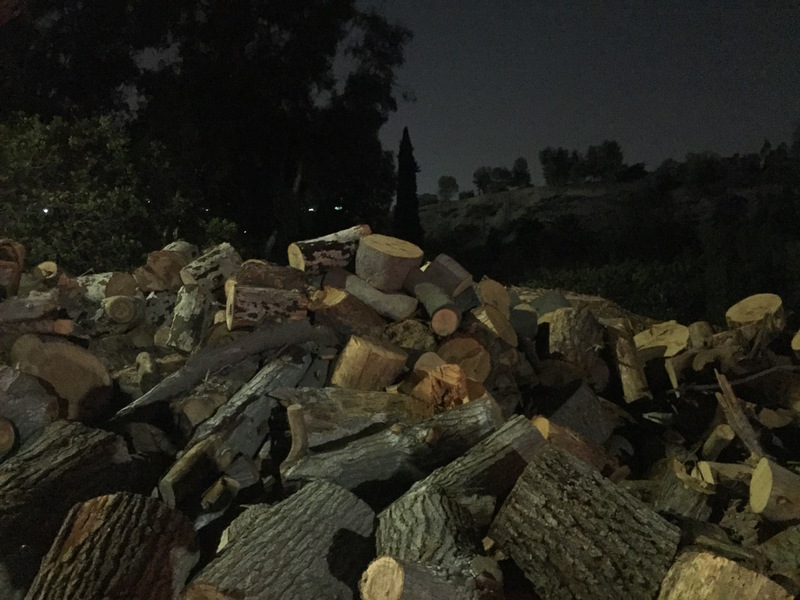 Scott Kazmir was the good Scott this evening, giving up just a pair of runs while the Dodgers’ bats fell silent. That is until Yasmani Grandal raked a three run homer in the bottom of the eighth. Hello, timely hitting. It’s nice to see you again. Kenley Jansen came on in the ninth and padded his saves record by getting Ben Revere, Jayson Werth, and Bryce Harper to all ground out to Corey Seager on just 12 pitches. It couldn’t have been a more perfect ending to my first half of the season. The Obscure Jersey of the Night Award goes to this guy. 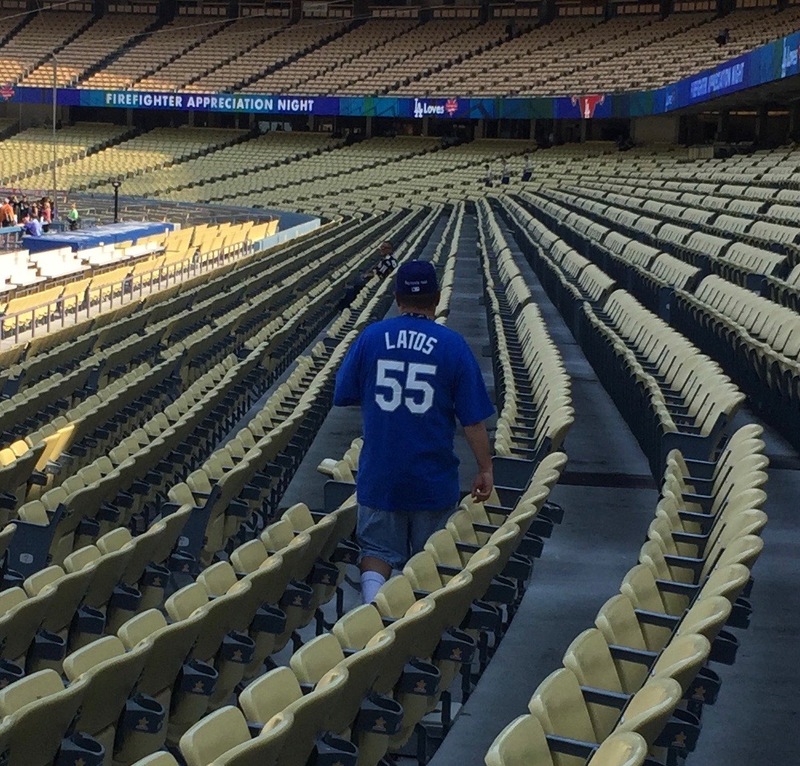 What kind of bet do you have to lose to be wearing a Mat Latos shirsey out in public? Snacks: Frozen adult root beer, frozen lemonade, frozen beer foam Kirin, Iced Blended Mocha, a few garlic fries, the only solid food I ate all day. It was that hot. Giveaway: Father’s Day boxer shorts! Sorry, Vin. 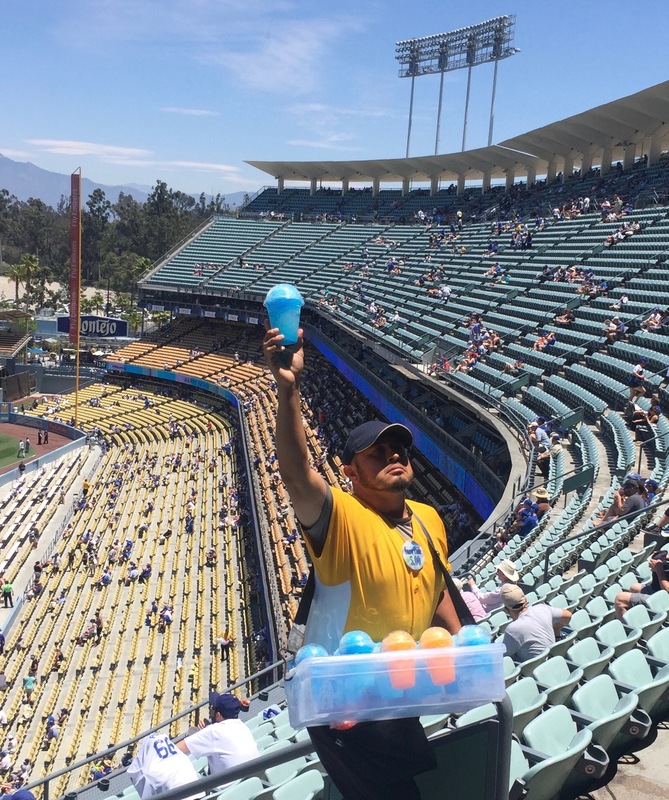 This sno-cone vendor was the most popular guy at the ballpark. 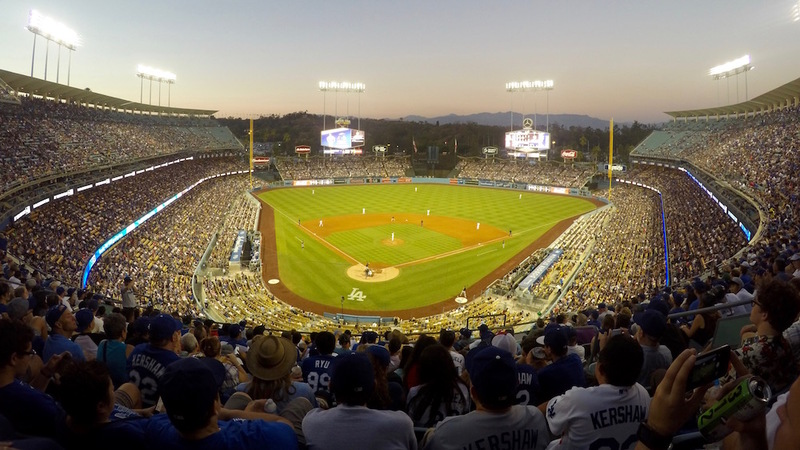 RECAP: This was arguably the most brutal Dodger game I’ve ever attended. And that includes the rock bottom misery of the McCourt era. With the heat index well past 100 degrees, staying cool was going to be everyone’s top priority. The Dodgers going for the series win? Whatevs. This was the crowd right before the game started. I think a lot of fathers out there willingly said yes to a trip to IKEA instead. Thanks to one of the best decisions I’ve ever made, our seats are in the shade with a row to spare. For day games, that’s a 20 degree difference and so clutch. The only problem was that a few of the regulars from the lower rows of our section had migrated up to the cool comfort of the shade. Things were quickly sorted out though. 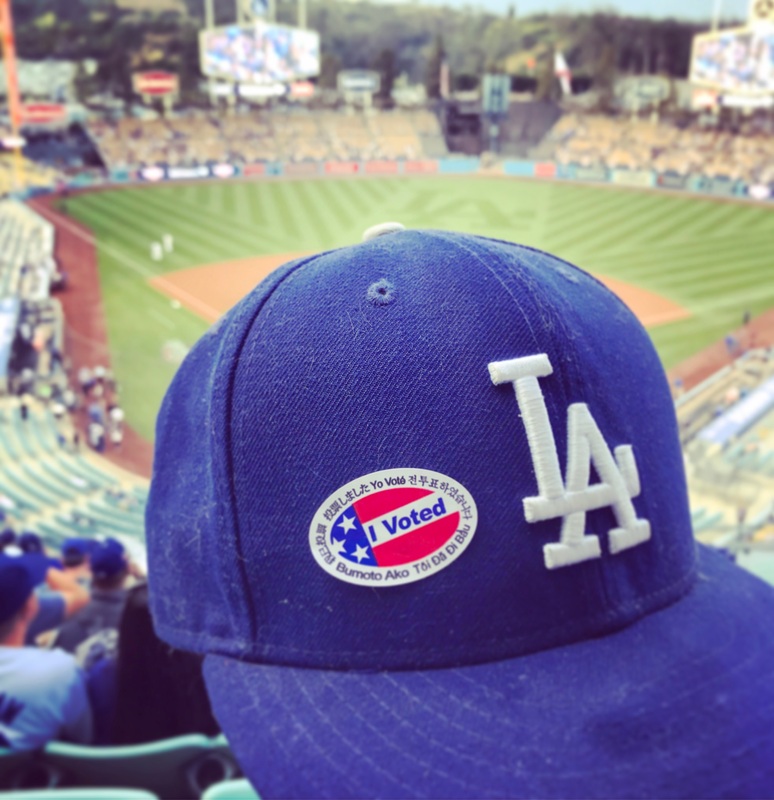 If the apocalypse ever comes to fruition during a Dodger home game, I shall rest easy knowing that part of Section 2 has the ability to swiftly and smoothly form a democratic utopian society. We all did a headcount and squeezed as many people into the shade that we could. It was nice to know that we had each others’ backs. Once our improvised seating chart was locked down, it was time to procure frozen beverages and I made the most amazing discovery. 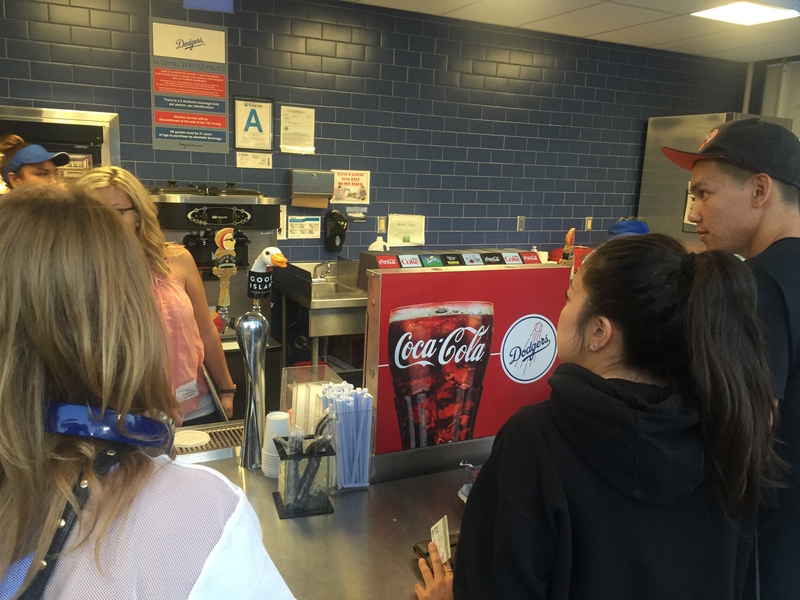 The inconspicuous Coffee Bean stand right behind our seats is actually a hidden oasis of adult frozen beverages and I was so excited I had to tweet about it. The only problem with the hard beer was that it did not skimp on the mystery alcohol. The consensus was that it was root beer schnapps and since it was literally my breakfast, I had to pump the brakes for the second round. But then I got right back on the day drinking horse. Due to all the booze and sugar, I had to pep things up for the final round. With the Brewers nursing a first inning 1-0 lead through the seventh, things were looking grim for the Dodgers and the few fans who remained. After Take Me Out to the Ball Game, my lovely wife tapped out and hid out from the heat in the New Era store. Anyone who has the MacGyver skills to fashion a hat out of a drink holder is someone you want on your side when the apocalypse goes down. The guy on the bottom right was one of many who turned his Father’s Day boxers into a Shemagh so you know he probably has a particular set of skills too. 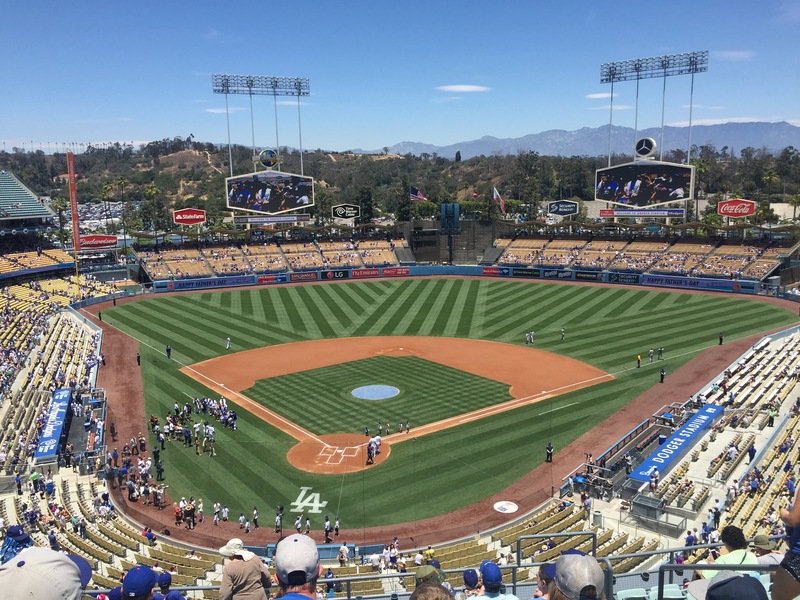 Once Kiké Hernandez tied the game with a home run in the bottom of the eighth, I decided it was probably a good time to make one of my better decisions since that time I picked out seats in the shade and go find my wife and call it a day. 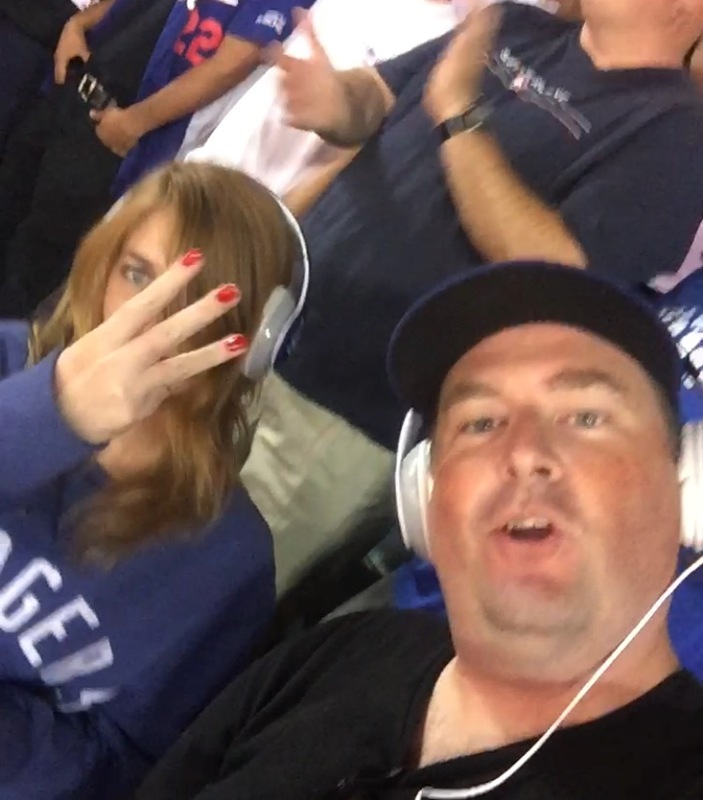 It was the second game in a row that I left early that ended with the Dodgers winning in a walk-off. (Maybe I’m their good luck charm?) 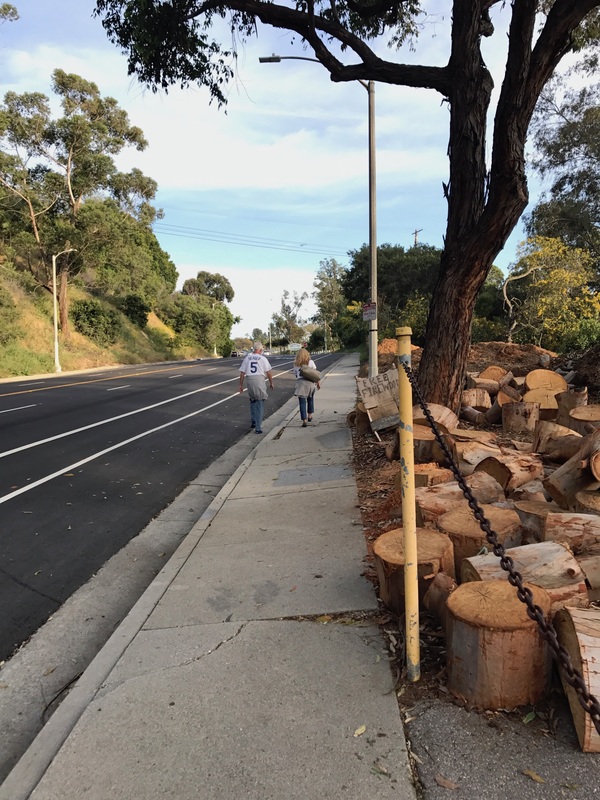 Thanks to absolutely zero traffic, we were deep into Silver Lake when Scott Van Slyke trotted home as the winning run and by the time the first mouth breather called-in to Dodger Talk, we were already rolling up our driveway. Getting to miss that segment almost made up for the brutal weather. Special Guest: Solo mission. I was recruited for bobblehead duty again and scored a pass to the Stadium Club. 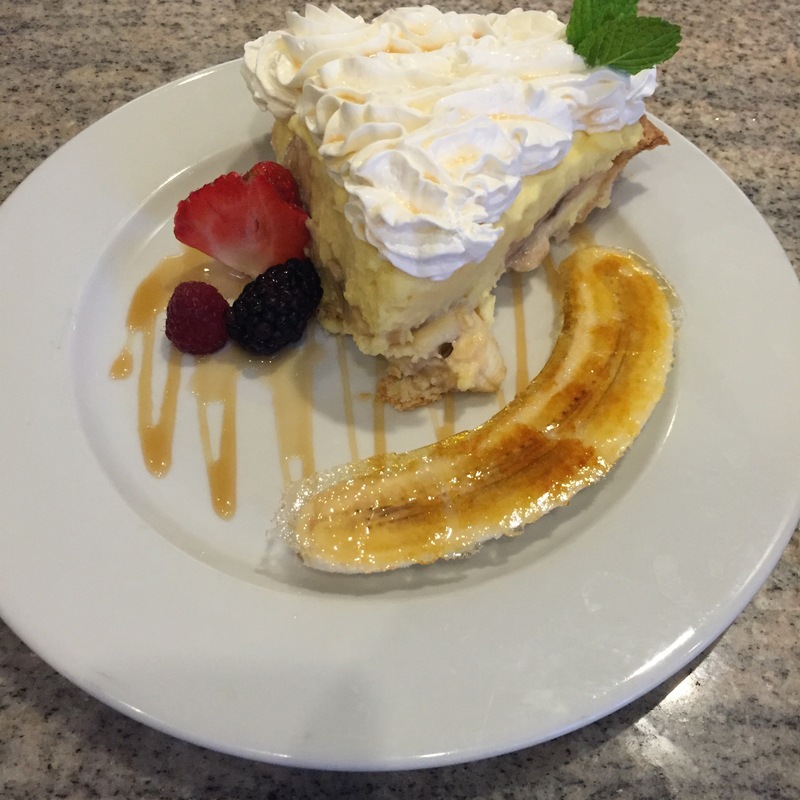 Snacks: Dodgers Blonde Ale (x2), taco salad, banana cream pie(!). Memorable Moment: Finding out Don Newcombe was on the mound when Vin Scully made his debut with the Brooklyn Dodgers. Hello, old friend. We meet again. 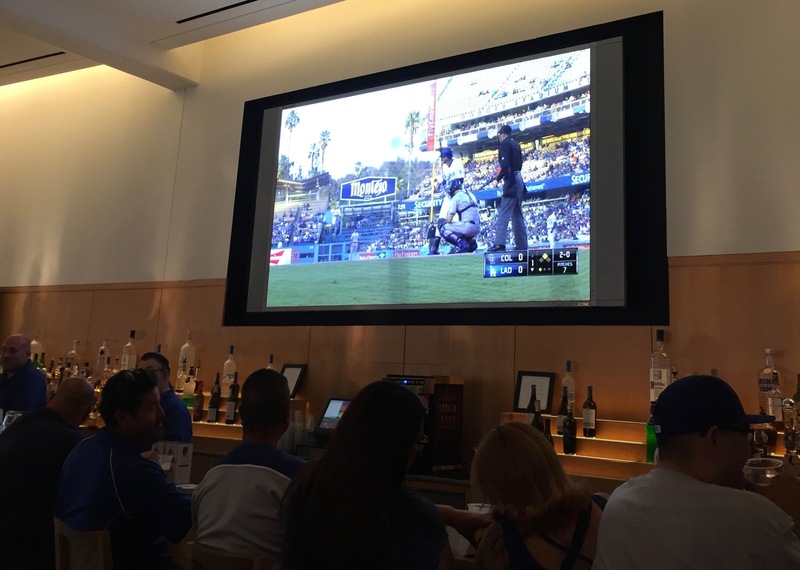 RECAP: Thanks to my burgeoning career as a bobblehead courier, I was able to crash the Stadium Club again. 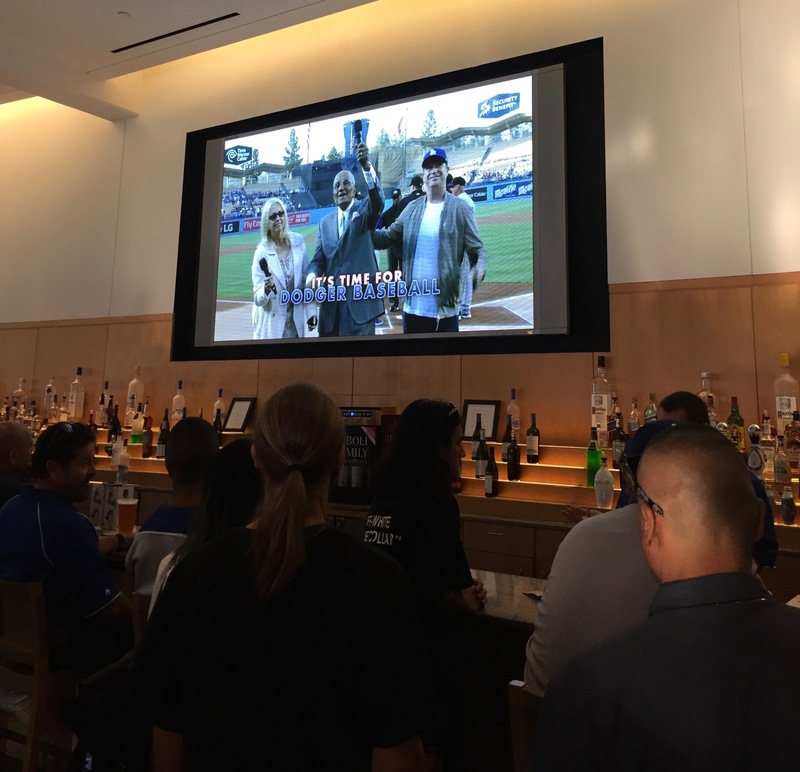 Now that I knew the drill, I headed directly to the bar and posted up for the pregame festivities honoring Don Newcombe’s 90th birthday. “It’s time for Dodger baseball!” – brought to you by Don Newcombe. Since I’m supposed be training for a triathlon (and didn’t want to feel too guilty about needing to eat a slice of banana cream pie) I opted for the Stadium Club’s taco salad. Goes to a baseball game and eats a salad. Yep. 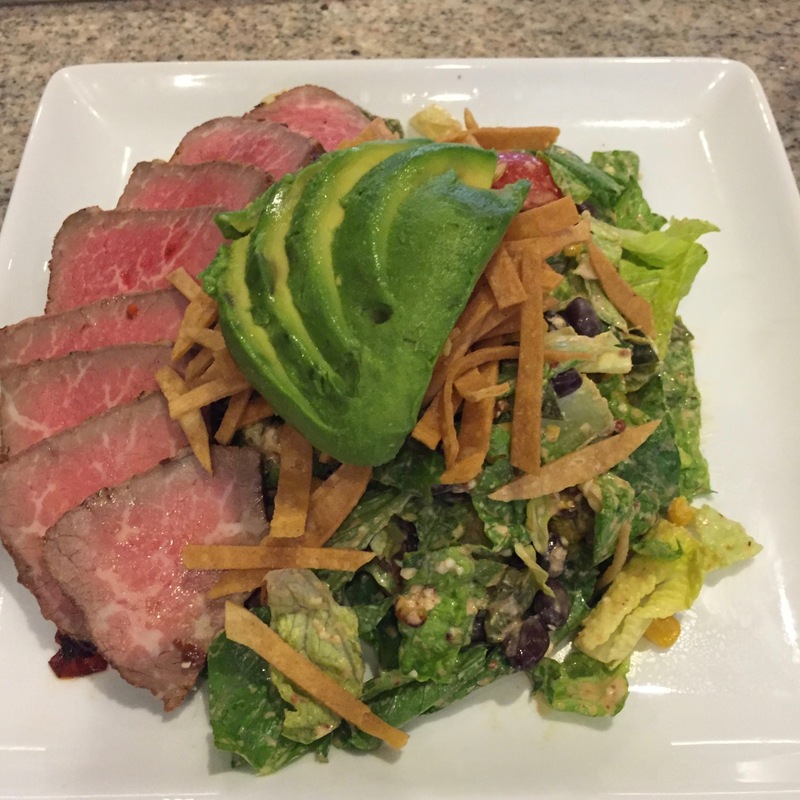 The salad turned out to be a perfect stress-eating companion for the game as the Dodgers proceeded to sleepwalk through nine innings. 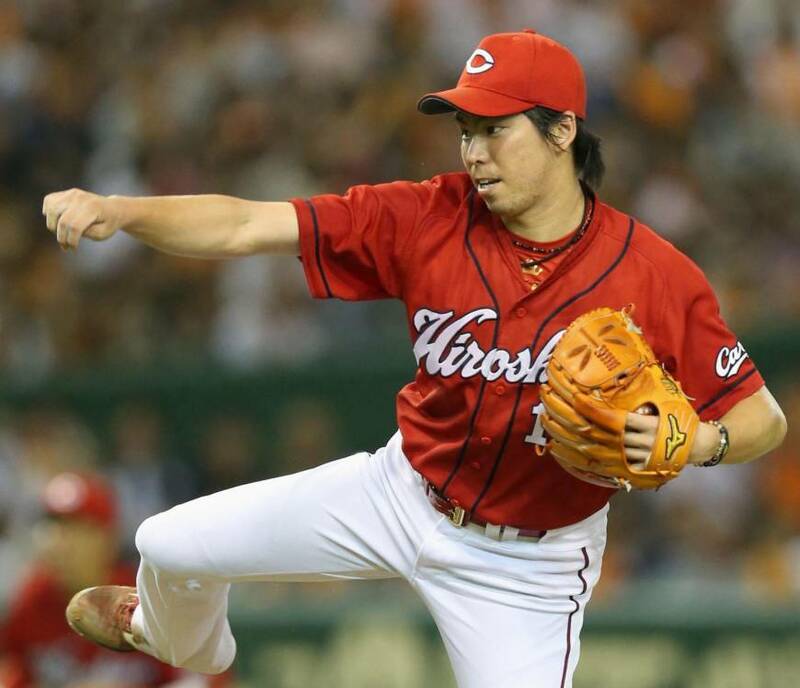 Kenta Maeda was solid on the mound until he gave up three consecutive hits in the seventh, which led to the Rockies (and the game’s) only run of the night. Despite the outcome, it was a great night to watch a game indoors. 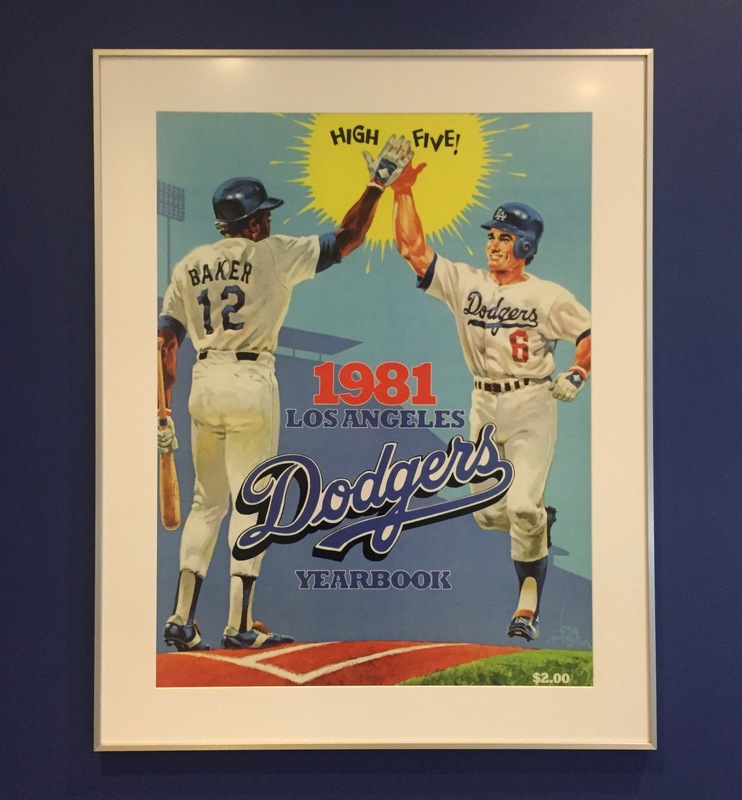 The high five was invented at Dodger Stadium by Dusty Baker and Glenn Burke on October 2, 1977. Four years later, it was featured on the Dodgers’ yearbook. Special Guest: Big Daddy Delino from Sons of Steve Garvey. Snacks: Dodger Dog, garlic fries, peanuts, and enough Shock Tops to numb the pain of the Giants fans surrounding us. Giveaway: Beating the Giants was the only gift we needed. 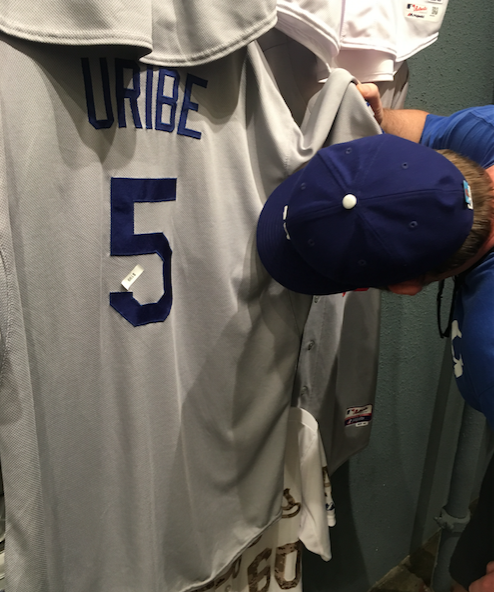 Memorable Moment: Sniffing Uribe’s jersey. 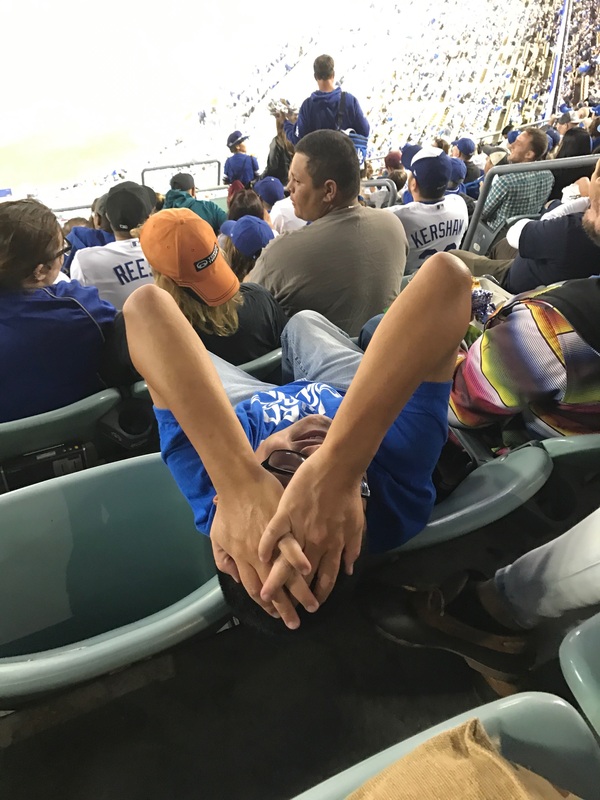 Son of Steve Garvey Delino protects his secret identity. RECAP: Like his namesake, my buddy “Delino” is also a native son of the Blue Hen State. I can’t begin to tell you what a privilege it was to have the second most famous Delino to ever come out of Delaware flying as my wingman for the game. 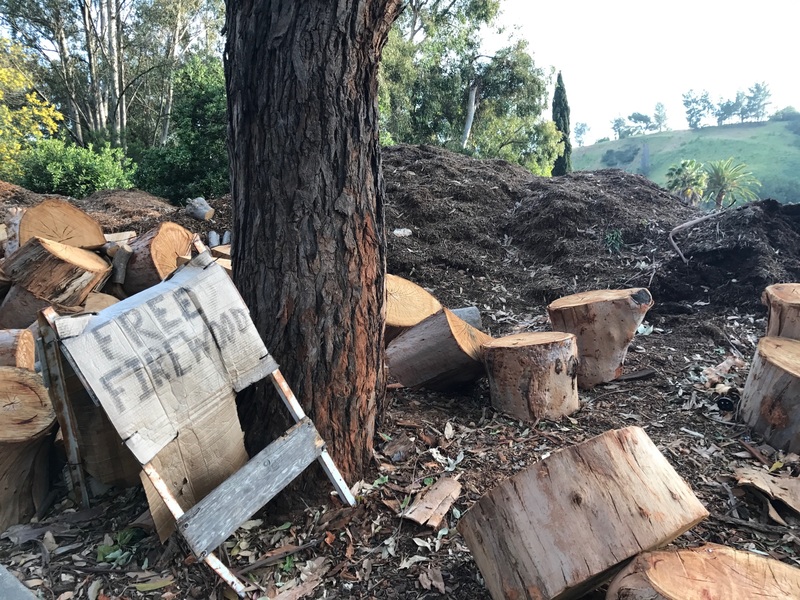 Delino and I go all way back to the early 2000s when we were neighbors in an apartment building that straddled the border between Los Feliz and Little Armenia. 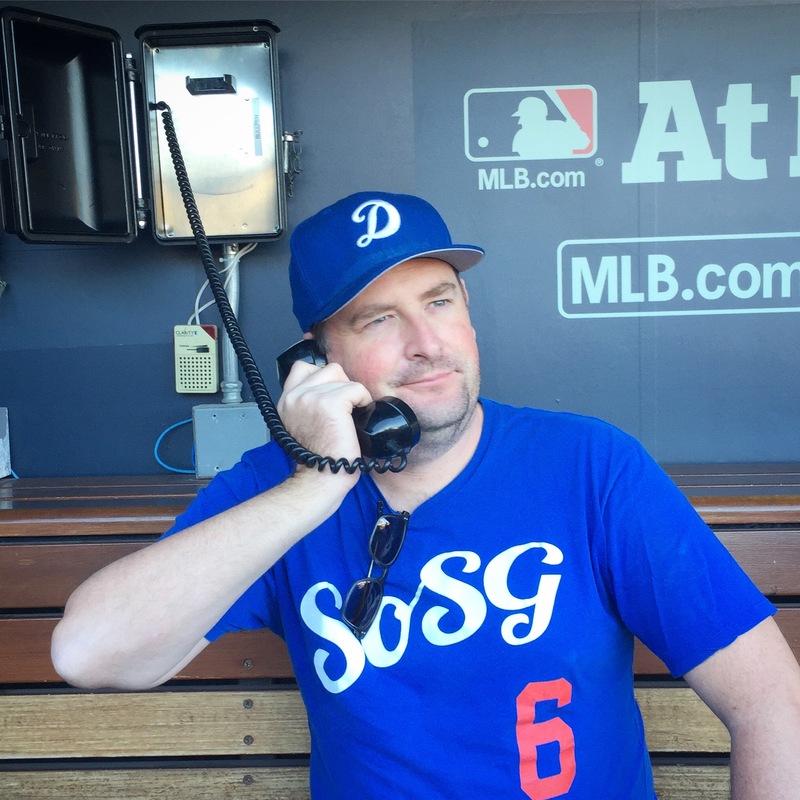 On more than a few occasions, I’ve parlayed my status of knowing one members of the ultra-secretive SoSG into marginally legit street cred among the geekiest Dodger fans. 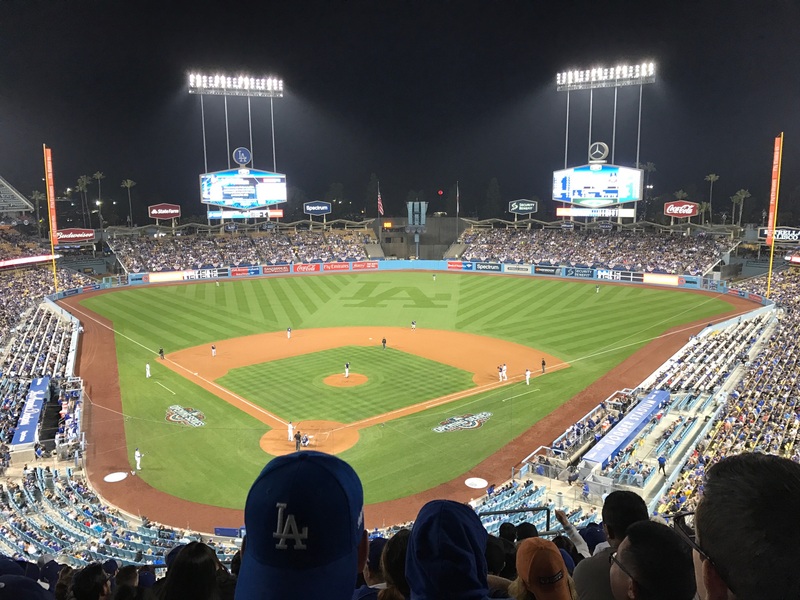 It was a welcome sight to see the Dodgers not stink up the joint during their first Sunday Night Baseball appearance of the season. I should be more optimistic but sometimes Sunday Night Baseball PTSD still creeps out thanks to having witnessed the horror and anguish of Jonathan Broxton’s legendary meltdown many moons ago. Between Joc’s two run jam and seven ridiculously solid innings from Kenta Maeda, the Dodgers flexed just enough muscle to keep any doubting vultures at bay. Puig coming out on the right side of a total Puig move (trying to score from second on a ground ball that made it 10 feet into center field) was the icing on the cake. In the top of the sixth, Delino and I abandoned our post and wandered off for beverage reinforcements (the Giants fans around us were more annoying than usual) and never returned. We ended up taking the long way down to the Field Level where I made a spiritual connection to a game used Juan Uribe jersey. 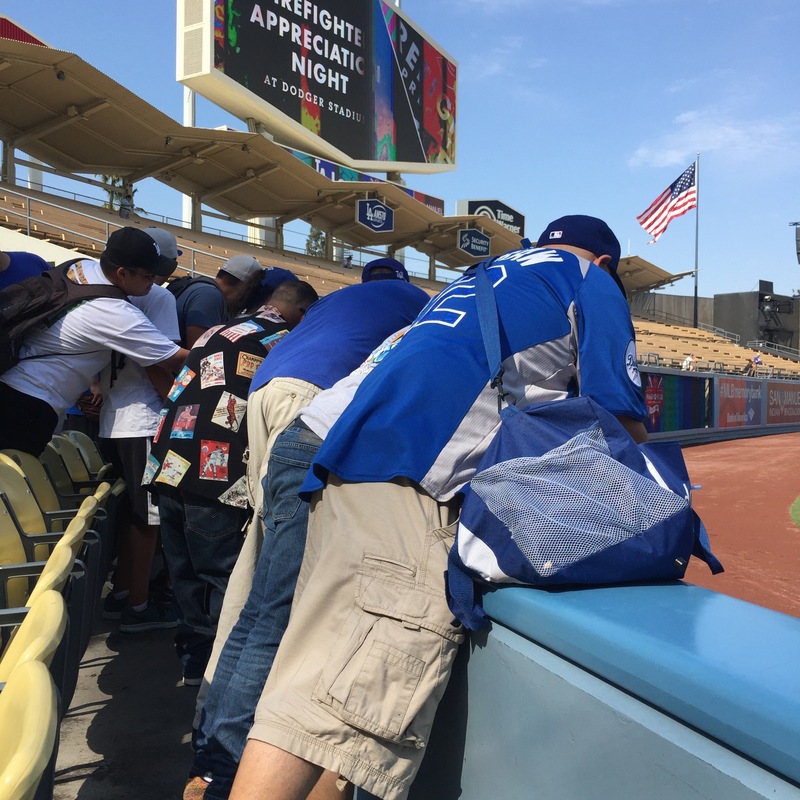 Soaking up the sweet, sweet smells of a dearly departed Dodger. 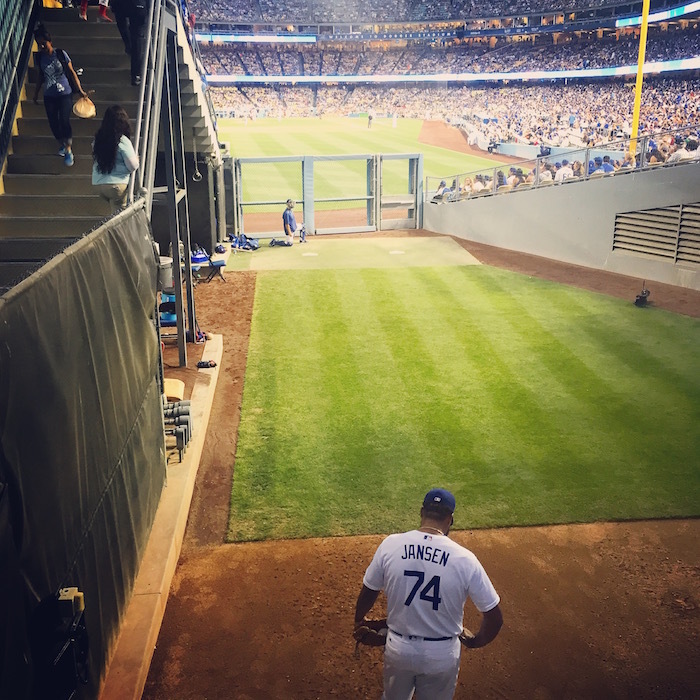 Our lap around the Field Level ended at the Dodgers’ bullpen. For some unexplainable reason, the seats directly over the mound were open so we got to see Kenley Jansen get ready to mow down the Giants. It was my first time seeing him warm up and I gotta say he was all business. Kenley Jansen goes through his pre-flight checklist. 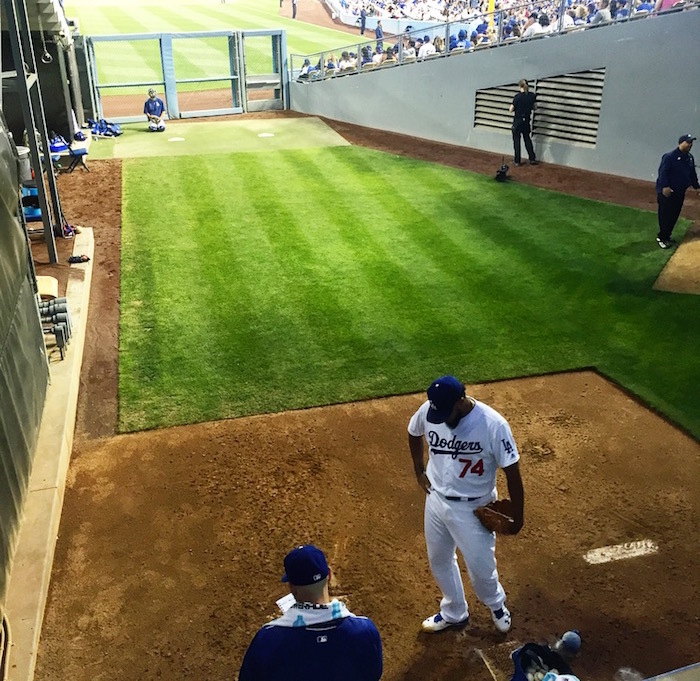 Once his cannon was properly pre-heated, Kenley stood patiently on the mound and waited for his cue. This photo was taken a split second before California Love started blasting. After giving up a single to Buster Posey, Kenley made quick work of the Giants, giving the Dodgers sole possession of first place. It was a perfect way to close out a weekend.